Myanmar is one of the ideal destinations for travelers all over the world. Making a trip to Myanmar, tourists will immerse themselves not only in poetic natural landscapes but also in the mysterious beauty of the sacred land of Buddhism. In addition, they will certainly appreciate the richness and diversification of the Burmese gastronomy. Typical and traditional dishes of Burmese cuisine include cakes and snacks that bear a unique character of the culinary culture in Myanmar. During your tours in Burma, you should not miss traditional Myanmar dishes such as Shan rice, Baung Doke – grilled fish wrapped in banana leaves, Susie kyethar Kyaw - roasted chicken with salt and chili, Thohk lahpet salad – a mixture of or green vegetables and fresh tea leaves always served at main meals, Mohinga - fish noodles at breakfast on special occasions, and many other curry dishes cooked with fruits, seafood, pork, chicken and lamb. In particular, the delicious cakes are not to be missed in order to better understand the Burmese cuisine. At every meal in Myanmar, apart from the main dishes, the locals take cakes for dessert. In all tea parlors in Burma you will easily see that there is always a plate of cakes available on the table to enjoy with hot tea or coffee. It is an interesting culinary practice of the Burmese. It can be said that these delicious cakes are one of the typical characteristics of the Burmese cuisine. Every morning, people in Myanmar usually eat a piece of cake made from rice flour and eggs, or a piece of grilled chapati served with cooked peanuts and white beans, while enjoying a hot cup of tea or coffee. Some people take a piece of Paratha cake sprinkled with sugar while others eat donuts that resemble the donuts of Western countries. These donuts are particularly delicious with coconut fibers and kumquats jam. During your Myanmar travel, you will see many types of donuts. They are very similar to green bean fritters in southern Vietnam. In case these cakes are offered in luxury restaurants in Myanmar, they are decorated much more attractively with a little nuts or raisins. According to the traditional recipes of the Burmese cuisine, most cakes in Myanmar are made from sticky rice flour or wheat flour, and sometimes these types of flour are mixed together. In Myanmar, people usually make savory biscuits. They often mix the flour with garlic, onion or ginger powder to obtain a strong flavor when cooking. Moreover, they also mix flour with coconut fibers, tomatoes, cabbages, herbs, curry powder or with sesame seeds to make different kinds of cakes which are extremely delicious and eye-catching. A tray of cakes often contains several components such as laphet or green tea leaves soaked in oil, served with sesame seeds, dried garlic, peanuts, coconut and some crispy cakes which resemble Vietnamese shrimp fritters but containing only vegetarian materials. When you make a trip to Myanmar, you can be invited to taste this tray of cakes. In particular, monks in Myanmar often offer a laphet plateau to the guests during their visit to the temples. 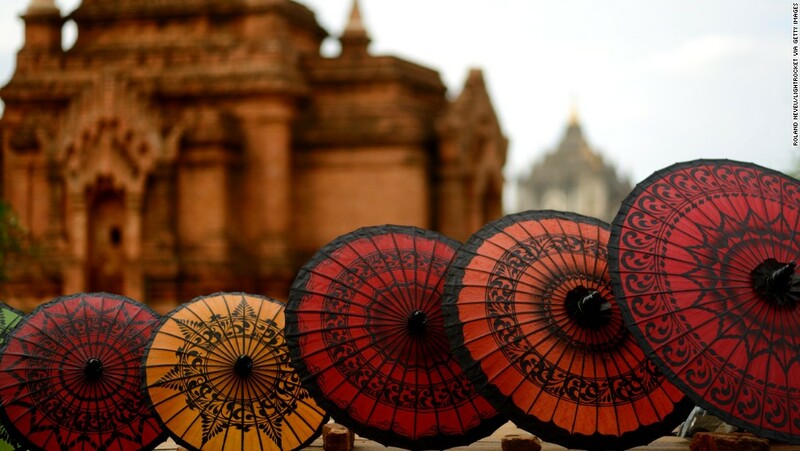 Admiring the sunset in this mysterious country while enjoying a cup of tea next to a tray of delicious pastries, or strolling through the streets to enjoy savory cakes will be great moments during your Burma tours. This type of cake is often to be tasted when visiting temples or inhabitants’. A trip to Myanmar is a great opportunity to discover the gastronomy that is both authentic and tasty. Cakes with unique flavors testify to the characteristics of the Burmese cuisine as well as to the rich culinary culture of Myanmar. Do not forget to enjoy your tours in Burma to taste these fascinating dishes. There is nothing more wonderful.